Prism’s bifacial modules are perfectly suited for commercial roofs with white or reflective “cool roof” technologies. A cool roof has a white or special coating that reflects more sunlight, allowing the roof to stay cooler and transmitting less heat to the building. The light reflected by the cool roof can be used by Prism Solar's bifacial modules in a way that can not be utilized by traditional PV solutions or inferior performing bifacial modules. 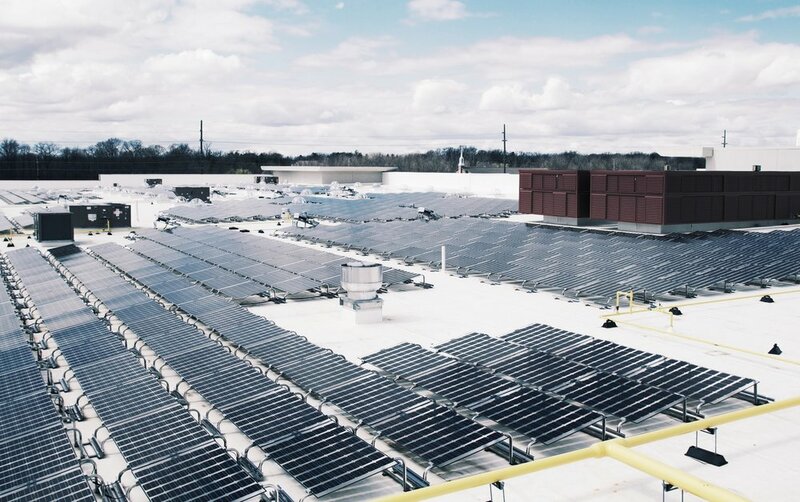 With the use of reflective backgrounds, like the ones found on cool roofs, our modules can increase the energy produced in kilowatt-hours by up to 35% over a conventional solar module, with an equivalent nameplate wattage rating. For details on maximizing the energy output please contact us. Prism's bifacial solar systems enable superior financial performance guaranteeing the highest return on investment over ALL other solar systems. Contact us to learn how. up to 100% more as compared to fixed angle ground mounts with conventional panels. Normally common for large utility-scale installations, these trackers also make an appealing alternative for standard roof-mounted residential solar. Curious how? Let us show you. This is similar to the white roof application above, the only difference is that modules and racking are installed directly on the ground, with various techniques of achieving higher reflectivities of the ground, resulting in boosts of additional energy captured by the backside of the modules.